CCDT’s Building Safe Communities Program in partnership with ‘Center for Positive Power’ organized a two-day workshop from April 4 – 5, 2018 on parenting, facilitated by Ameeta Sanghavi Shah, a psychotherapist, life coach and trainer with over 20 years experience. 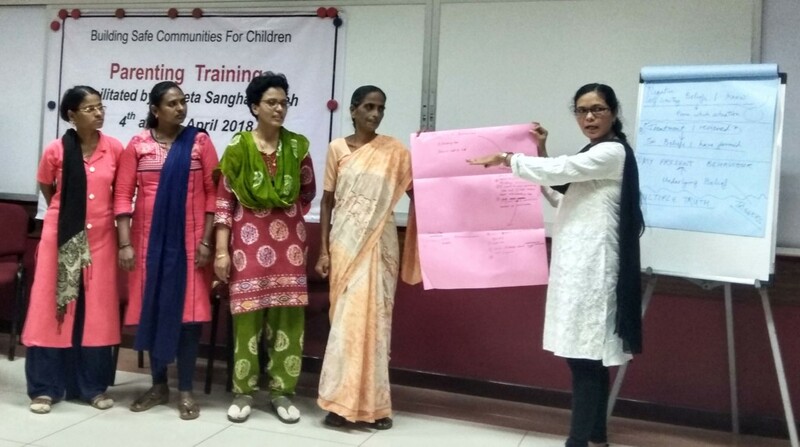 The workshop was attended by CCDT and its partners Pratham and YUVA, who jointly implement a UNICEF program to safeguard vulnerable children from abuse and exploitation. The program leverages the involvement of children and young volunteers from slum communities in Dahisar to advocate for safe spaces for children, thus demonstrating a model of ‘Safe Communities’. The modern world with its rapid changes, heightened media, brand influences, peer pressure and instant gratification culture — has left parents at a loss as to how to parent well. Gone are the codes of conduct and rules with which people lived, parents now have no reference point for parenting well. To equip parents with knowledge, skills and appropriate attitudes on parenting, CCDT along with UNICEF’s Child Protection Unit facilitated a training program on violence-free parenting. Twenty-one members from CCDT, Pratham and YUVA participated in this training. Participants were led through WiSH Parenting’s (Wisdom System of Holistic parenting) basic framework of why the energy of love is far more effective than that of fear. And how communication that is used mindfully and influentially is the basic structure of effective parenting. The workshop emphasized the need to reduce the importance of obedience and rules, and instead help children develop in a way that makes them resilient, confident, independent and able to make appropriate life choices. The facilitator leveraged activities such as in-depth group discussions on parenting styles and influential communication to resolve conflicts and power struggles — as well as roleplays on how to set and maintain boundaries.